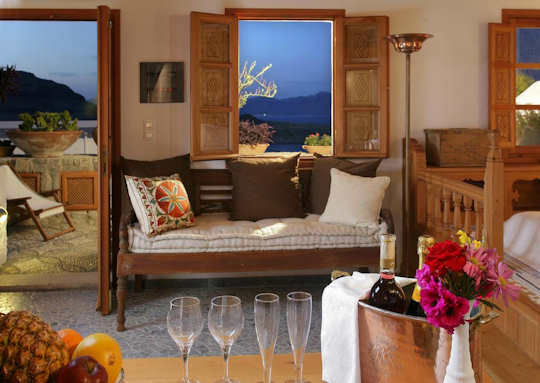 A Romantic Greece Vacation - our tips for small quality hotels in special characteristic locations - choose one or all of them for a special holiday, a honeymoon, an anniversary or engagement trip. Where - we share our favourite romantic places below in Crete, Rhodes, Santorini and Athens ... places for your own love story to unfold. When - when to Travel - for privacy and more chances of romantic candlelit dinners for two, we suggest you travel to Greece in spring or autumn. Travel in May/June or September/October for more opportunities for securing your dream booking, better rates, less fuss and less crowding. In these seasons you can swim in the Mediterranean and enjoy beachside relaxation and couple's time, without the crowds. How - if you do want to visit all of these islands, use Athens as a hub - it would be best to fly in and out of Athens airport rather than take long ferry rides. The cramped ferry cabins do not make the most romantic places! Make the most of your time in Greece by taking short flights in and out of Athens, get to a different island before lunch! 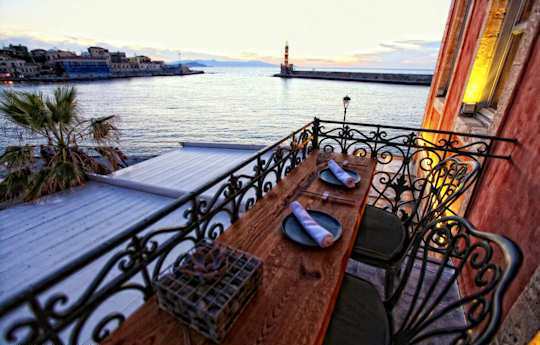 Soak up the atmosphere of the old town of Chania, eat dinner by the reflected waters of the Venetian harbour, stay in a restored boutique hotel. This is one of our most romantic favourite places in Crete. We love the atmosphere, the character of the old streets and mosaic of architecture all cobbled together around the harbour side. Romantic Greece Vacation - Lindos just has to be one of our favourite places in Rhodes. A magical seaside village which is small, surrounded by beaches, has the most fascinating history and breathtaking views. The narrow white laneways of the old village are traditional, historic pathways that take the visitor back in time. Located 50 km from the capital of Rhodes and 51 km from the airport, Lindos is a white-washed village clustered around the base of a rocky Acropolis which has been inhabited since ancient times. A truly striking prominent hill, it has ruins of Greek and Roman temples with sweeping views around the coastline. 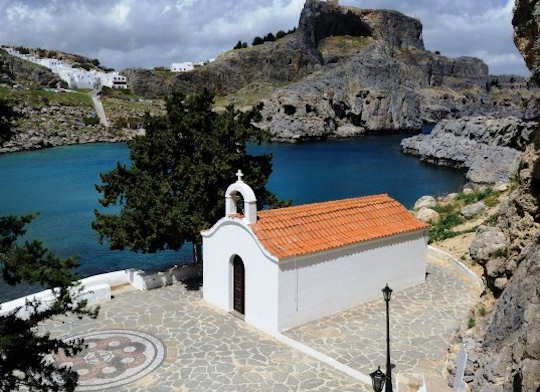 For those of you getting serious and planning nuptuals or a family gathering and feast, there from the top of the Lindos Acropolis you will look over the sweet circular protected bay of Agios Pavlos and spy a sweet tiny chapel in white with terracotta tiles. 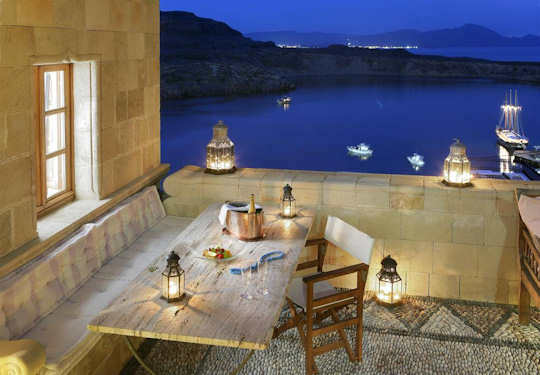 This location is very sought after, as it has to be one of the most romantic spots in Rhodes (pictured below). Lindos is surrounded by blue bays and sandy beaches, the main beach is a long sandy beach with clear waters in a deep craggy bay. To the north is Vlicha Beach, another sandy beach and romantic restaurant 'Ktima' (pictured below) with a little white chapel and sweeping views over the sea to the north, didn't we say this was a romantic spot? 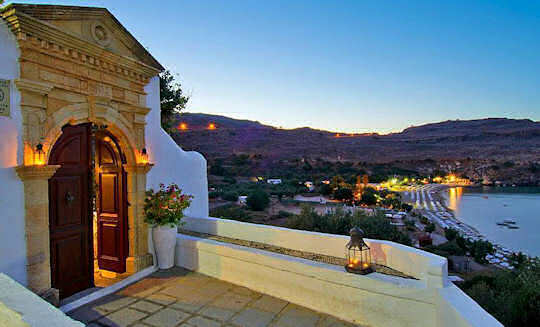 In Lindos, stay nowhere else but the most romantic hotel you will ever find - the exceptional Melenos Lindos Suites. This hotel has only 12 luxury suites where every detail is exquisite. The artistry of the buildings, the shapes, the colours and design of the courtyards are all restorative to the eye and the soul. 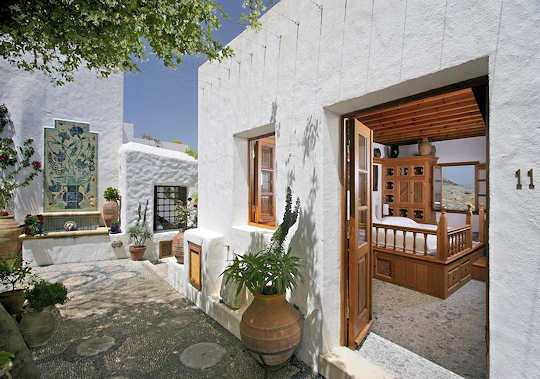 The style and design can only be matched by the location overlooking the main bay of Lindos. It is such a great location that there is a restaurant on the roof top terrace. 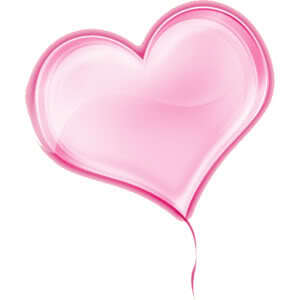 Did we mention romance? And yes we delivered. 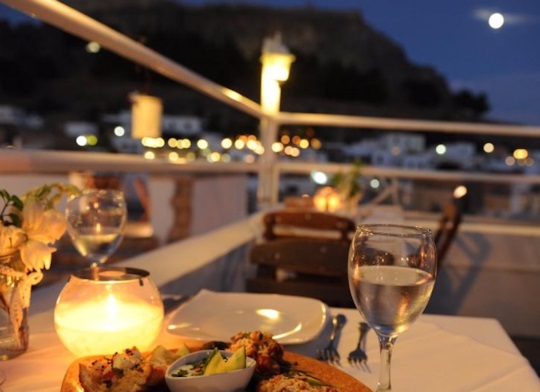 Take your special partner here and just ease into the very essence of Lindos; romance in every stone. 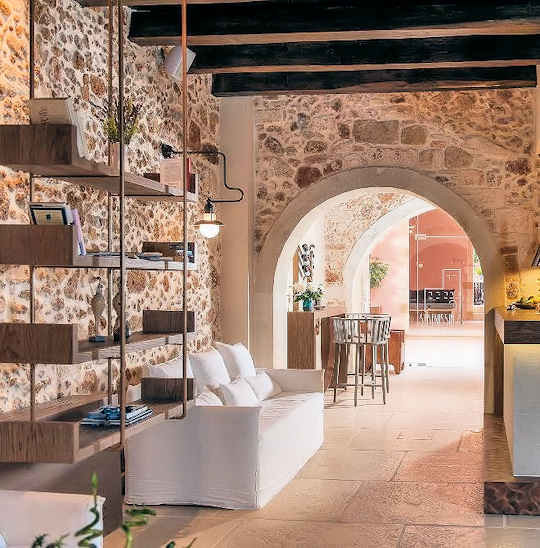 Just a pebble's throw from the Acropolis, on the outskirts of the whitewashed village, these private suites will stay in your heart for a long, long time and call you to return. With wonderful service and attention to detail evident at every turn, with sweet touches such as poems and flowers in your bedroom, and beauty such that these images don't do it justice. 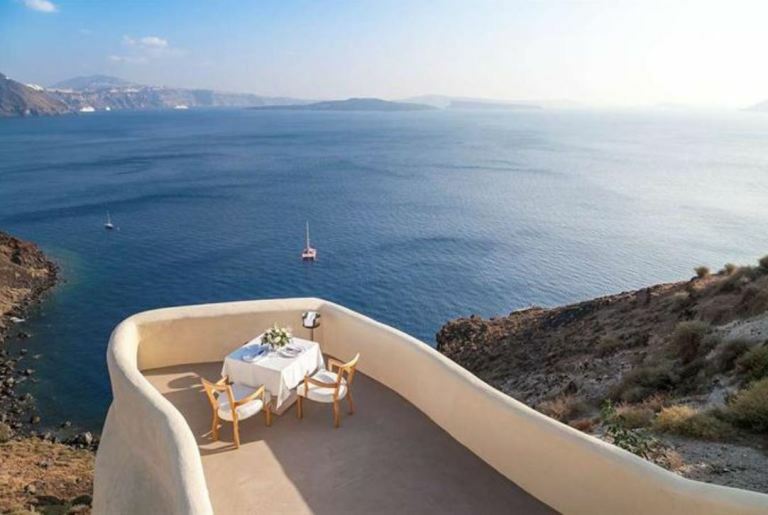 Mystique Boutique Hotel Santorini - a private dinner for two - what more perfect romantic setting? It is suggested that you visit Santorini in the spring - in May and June you will be able to explore and enjoy the stunning steep cliffsides without jostling and bumping into millions of tourists. Really in summer it gets waaaay too busy, not romantic at all! 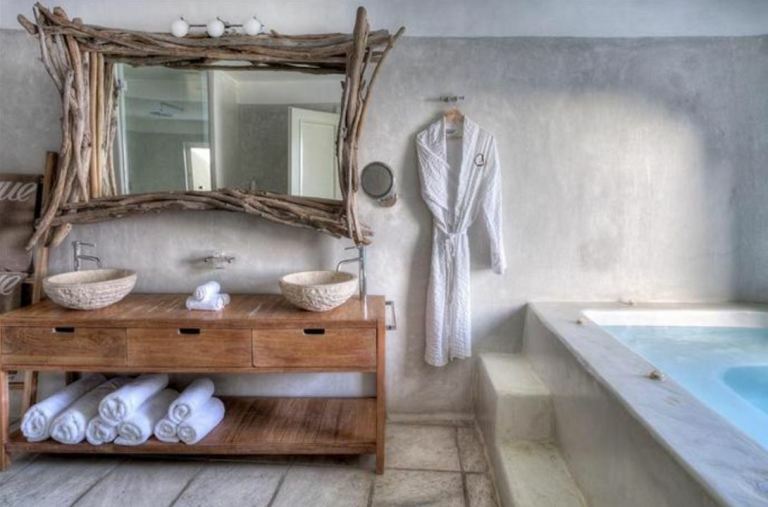 The Mystique Boutique Hotel is a one of a kind in the world - a luxury experience in the most beautiful part of the island - Oia. 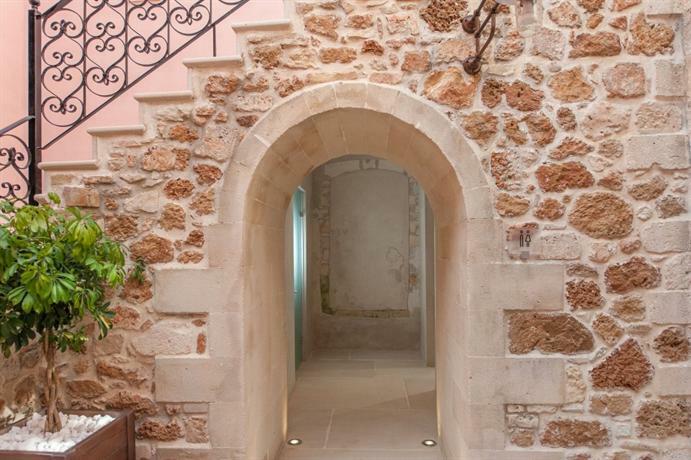 With spa services, a wine cave and traditional Greek breakfast in the morning, romance comes naturally. 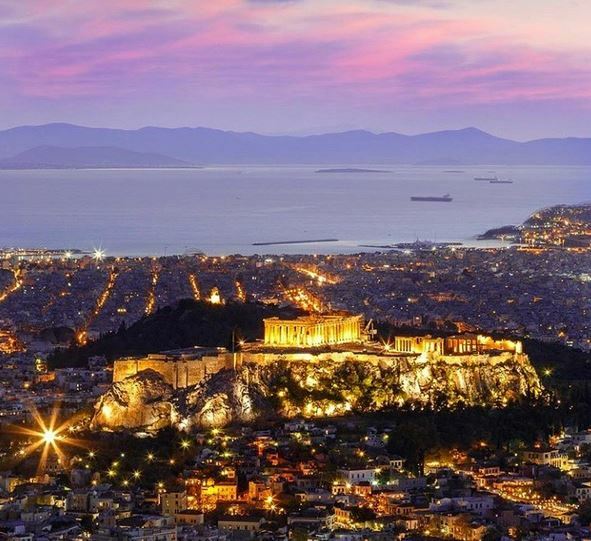 Romantic Greece Vacation Tip - when in Athens, stay in an apartment with a rooftop balcony and views to the famous Acropolis, where the Parthenon is lit up at night and creates the perfect backdrop for romance. The most romantic historical hotel to wow your partner would have to be the Grand Bretagne Hotel right in the centre of town on Syntagma Square. This is luxury defined. Incredibly romantic and quite extraordinary. 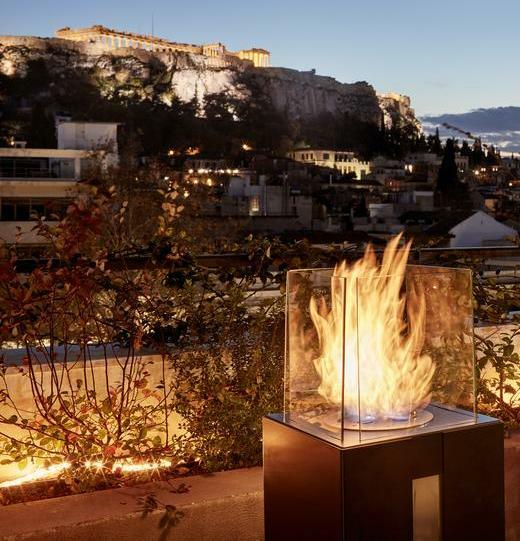 From the rooftop restaurant you will enjoy a sublime view of the Acropolis and the Parthenon. Our favourite place to stay in Athens is Plaka, because it is full of romance and history at every turn, because it is like a little Greek village at the base of the Acropolis, because in Plaka you can walk without stress and not feel like you are in the metropolis. In Plaka you can walk everywhere, enjoy the Ancient Agora and outdoor spaces, hand in hand, with your lover, enjoying the ageless life of Athens. Romantic Greece Vacation - a smaller, even more romantic setting with views to the Acropolis and the Parthenon from both the rooms and the roof top restaurant is Zillers Boutique Hotel - do Athens in style from this funky hotel - centrally located yet very quiet, with views and ambience oozing at the modern rooftop restaurant. 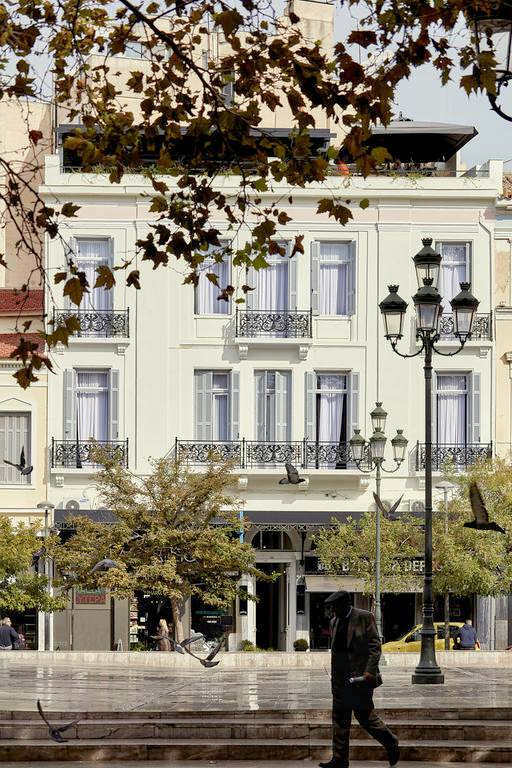 Set in a restored neoclassical building (pictured above) in the characteristic streets of Plaka, with attention to detail taken into every architectural detail, this hotel is a treat to discover. 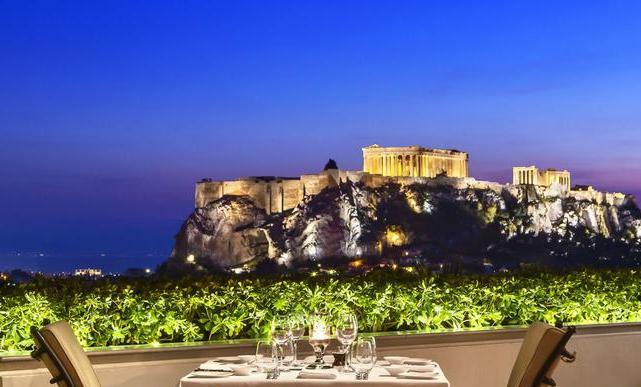 Ensure you ask for a room with a Parthenon view, and make time to enjoy the bar and Roof Garden restaurant. The soul of the islands and the pulse of life in Athens will bring out the passion in any relationship - we trust you have enjoyed our Romantic Greece Vacation tips and embrace the love and life of this special country - please tell us your stories - contact us! We are hopeless romantics at heart and love to hear stories of couples' experiences in Ellada.